ET Disclosure of both humanoid and non-humanoid (extra-terrestrial) life in existence on the surface of Earth and throughout our galaxy. Cancels all credit card, mortgage, and other bank debt due to illegal banking and government activities. Many refer to this as a “jubilee” or complete forgiveness of debt. Abolishes Federal Income Taxes in the U.S. Creates a 17% flat rate non-essential new items only sales tax revenue for the government. In other words, food and medicine will not be taxed, nor will used items such as old homes. Abolishes the Internal Revenue Service (IRS), with employees of the IRS will be transferred into the US Treasury national sales tax area. Restores Constitutional Law to all courts and legal matters in the Republic of the United States of America. Retrains all judges and attorneys in Constitutional Law. Removes all dark cabal agents and administration officials and all members of the U.S. Congress from their positions due to their continuous unconstitutional actions. Establishes new Presidential and Congressional elections within 120 days of GESARA’s announcement. Allows the new Republic of the U.S. to temporarily govern the country’s affairs until fair and legal elections can be held. International Monitors will be present to prevent illegal voter ballot stuffing or fraudulent election activities of special interest groups. Eliminates all “states of emergency” thus declaring peace for every land abiding by GESARA and it’s alliance. 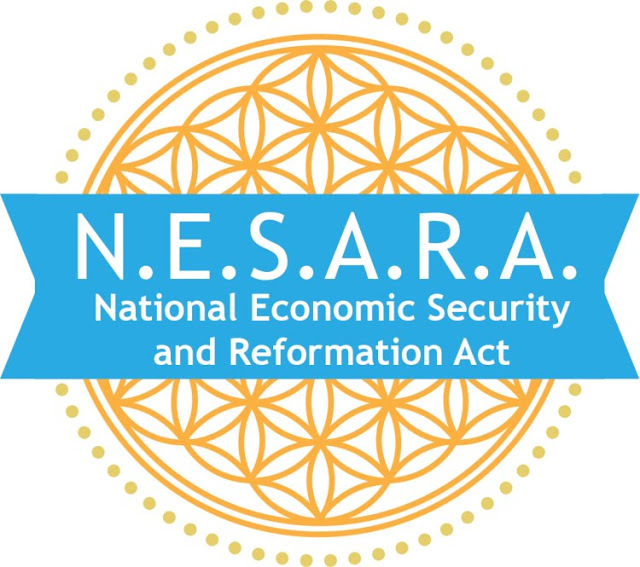 Allows the new Republic to physically remove or eliminate any obstacle impeding GESARA law. Ceases all aggressive U.S. government military action worldwide. Forces the U.S. military to immediately remove troops from all sovereign nations that no longer willingly accept them to reside on their soil (including Iraq, Syria, Afghanistan, Philippines, etc.). Creates a new U.S. Treasury rainbow currency backed by gold, silver, platinum, and precious metals, ending the bankruptcy of the United States initiated by Franklin Roosevelt in 1933. Eliminates the Federal Reserve System. During the transition period, the Federal Reserve will be allowed to operate side by side of the U.S. treasury for one year in order to remove all Federal Reserve notes from the money supply. Establishes peace throughout the world as monitored by the United Nations Security Council. Releases unprecedented prosperity funds in a “share the wealth redistribution program” for every individual on Earth as well as the release of enormous sums of money for humanitarian purposes across the planet. This means that every human being could become a multi-millionaire instantly without debt of any kind. This is in alignment with the Global Currency Reset & Revaluation (GCR-RV). Stay up-to-date on developments. Click here. Enable the release of over 6,000 patents of suppressed technologies that are being withheld from the public under the guise of national security, including free energy devices, anti-gravity, and sonic healing machines. Eliminates all current and future nuclear powered weaponry on Planet Earth. Increases benefits to senior citizens and children. Forbids the sale of American birth certificate records as chattel property bonds by the U.S. Department of Transportation.